Membership in the FTChamber is open to any local Business Owner, their employees, and any interested Community Members. All FTChamber Members work for the good of the entire Franklin Township by joining together in many activities and projects. Teaming with the FT Lions Club & FT Civic League to sponsor the Franklin Township Annual Christmas/Holiday Family Assistance Program, July 4th Fireworks, the Village Flag Project and more. FTChamber General Monthly Meeting is on 1st Tuesday of each month. Please be sure to check our calendar for dates & time. With roots beginning in the 1940’s, a local group of neighboring merchants all working in the Town of Wanamaker, gathered and formed the Wanamaker Businessmen’s Association. As with many organizations of the era, this was a male-only club. Records show that Floyd Cox held the first title of President in 1947. On March 5, 1954 documents were filed with the State of Indiana to create formal non-profit domestic corporation status, under the name of the Wanamaker Businessmen's Association, Inc. Although the initial focus of the group was Wanamaker, the 60's brought in business owners from the Town of Acton, just down the road on Southeastern. 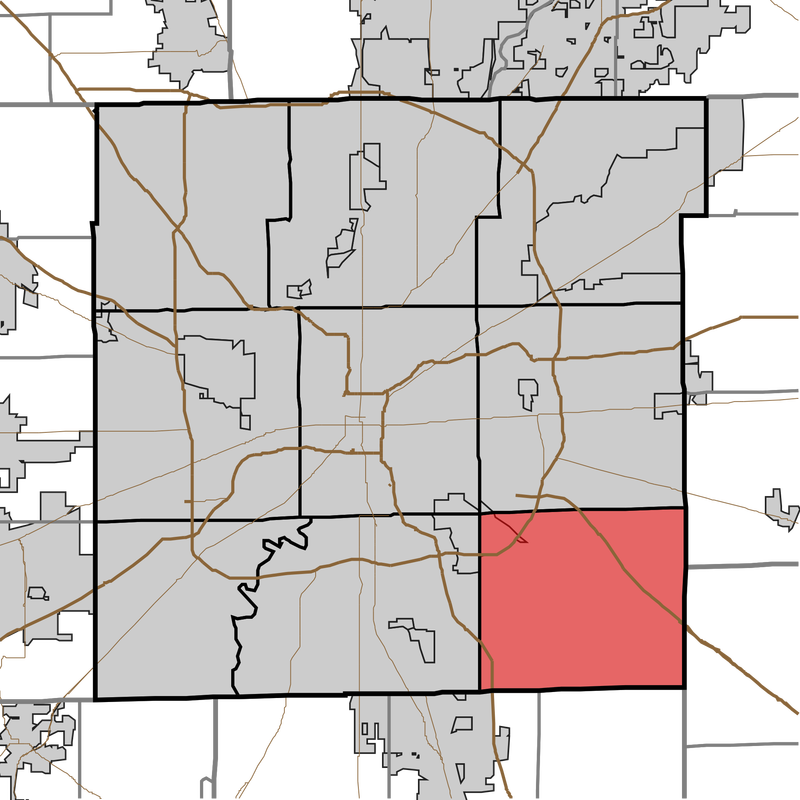 In the early 1970's, the City of Indianapolis expanded out to the four corners of Marion County and the Towns of Wanamaker and Acton were absorbed through the Uni-Gov Plan. As the area population grew and business interests expanded throughout southeastern corner of Marion County, the organization began to attract businesses from the far corners of the township. Women were eventually permitted membership. President in 1986, Mrs. Sandy Harlow, served as the first female president. Membership and attendance in the group slowed in the late 80's and early 90's, reflecting the low attendance and organizational-apathy seen in many non-profit and service groups in the Midwest. Records show that discussions were held to debate whether the need still existed, and if the time had come to disband. A small and dedicated core group agreed to keep the group alive, but to refocus the energy township-wide. On February 2, 1992, at a meeting called by the corporation Board of Directors, the thirteen "members or delegates entitled to vote" voted unanimously to Amend the Articles of Incorporation and change the name to the Franklin Township Chamber of Commerce, Inc. The Articles of Amendment were signed by Linda E Casey, Vice President, and accepted by the Indiana Secretary of State into the records on July 9, 1992. Elected as President for the newly named FTChamber in 1992, Cheryll A Smith also held the office in 2003 and 2004. Four people have served two-year consecutive terms; L William Jeffris 1955 & 1956, Joe Huff 1996 & 1997, Anndee L Gosnell 2005 & 2006, John Gorman 2007 & 2008 and our current President Dee A Young. The honor of "longest, active President" goes to David Baird who served in 1981 as a young business man early in his careerand is still an active member of the FTChamber some 30+ years later. The youngest person to serve as President is Kevin R Wheatley who served in 1978 at the age of 24. The youngest female President is Anndee L Gosnell, as she was just 25 when elected into office in the Fall of 2005. In 2013, the group celebrates 66 years of continuous existence. February 2013, marks 21 years as the Franklin Township Chamber of Commerce, aka FTCC or FTChamber. There have been 58 different Presidents. 11 females have served in this capacity, inclusive of our current President Dee A Young. A complete listing of all the Presidents of the FTChamber can be seen on the website on the Our Presidents page. 70 Years and still growing! Situated in the southeastern corner of Marion County in Indiana, Franklin Township is a rapidly growing area of Indianapolis. Indianapolis is the State Capital of Indiana. cultural,social, sporting and recreational advantages found in a large city and a community with an excellent school system.